Positive: Decent hardware; nice screen and ergonomic keypad. Negative: Pretty massive and heavy. 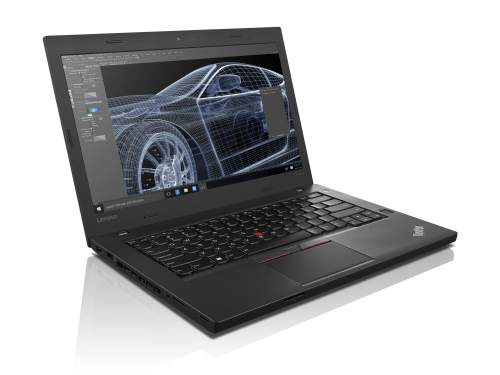 Model: The Lenovo ThinkPad T460p is a laptop with focus on performance according to Lenovo. The design of the laptop is durable and professional. While the base unit is made from magnesium, the lid is made from plastic. The Microsoft Windows 7 Professional 64-bit system uses a 2.6 GHz Intel Core i5-6440HQ processor, 4 GB DDR4-2133 single channel RAM (max. 32 GB), and a 500 GB hard disk from Toshiba. The laptop sports a 14-inch IPS display with Full HD resolution (1920 x 1080 pixels), which produces sharp and detailed images. However, the laptop is not suitable for professional graphic design and image editing due to its low color gamut. The keyboard offers a responsive and comfortable typing experience and the responsive touchpad supports Microsoft Windows 10 gestures. In terms of connectivity options, the laptop covers all the basic necessities and includes three USB 3.0/3.1 Gen 1 ports, an HDMI port, a DisplayPort, a docking station port, an audio combo jack, and a 4-in-1 card reader (MMC, SD, SDXC, SDHC). The 1.925 kg system achieves a battery life of up to 4:25 hours during Wi-Fi web surfing. Intel HD Graphics 530: Integrated GPU (GT2) with 24 EUs found on some Skylake CPU models (mobile and desktop). Modern games should be playable with these graphics cards at low settings and resolutions. Casual gamers may be happy with these cards. » Further information can be found in our Comparison of Mobile Graphics Cards and the corresponding Benchmark List. 6440HQ: Skylake-based quad-core processor for notebooks. Offers an integrated HD Graphics 530 GPU and is manufactured in 14 nm.» Further information can be found in our Comparison of Mobile Processsors.